Finally!! 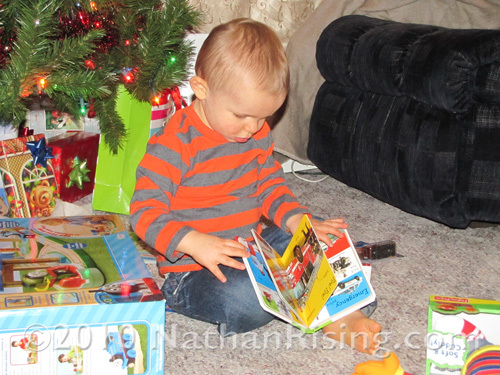 I am posting Nathan’s Christmas pictures! Christmas was great. Ok, make that really freakin’ adorable. 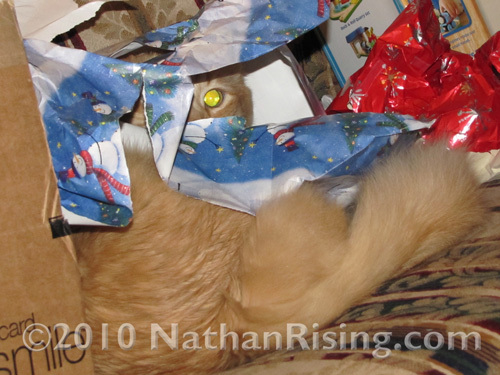 When Nathan first came into the living room, he didn’t even notice the presents under the tree. But once he DID notice them, he made a beeline right for the Christmas tree, craning his neck as his arms waved ahead of him as if to summon the presents directly into his slobbery outstretched palms. 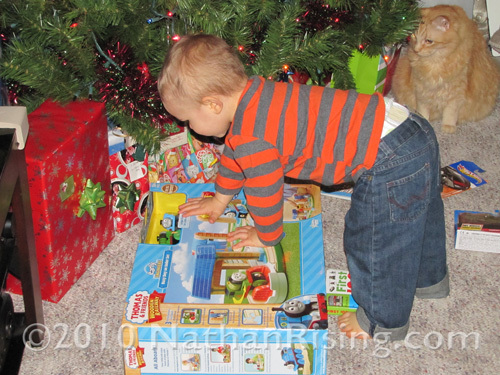 After he opened some of his presents, he played with them and was really enjoying this thing called Life when all of a sudden the Bad Mood Fairy came and pooped on everything. 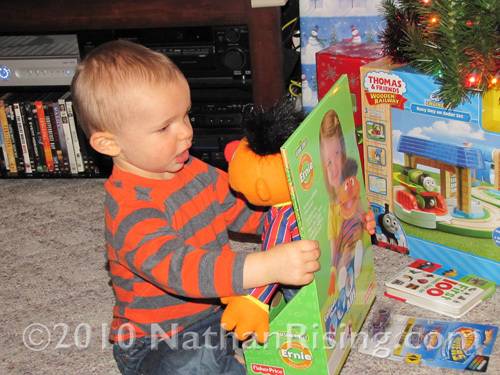 Nathan was having so much fun playing with the presents that he had already opened that he absolutely did not want to open any more. Paul and I would hand him a present only to have it slapped away with a dissatisfied grunt. 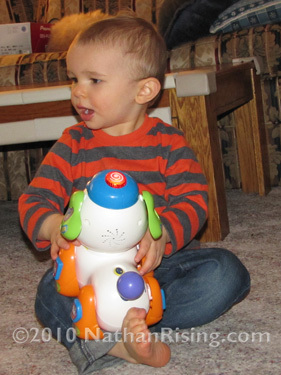 He let us know that he needed to play with his newly opened toys for a while (as in, we had to delay the rest of Christmas!) 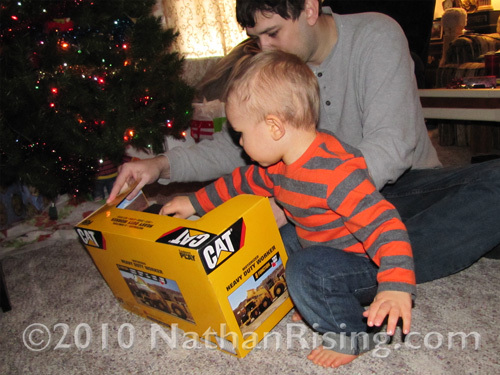 before he would even think about opening any more. Which I would have never expected. 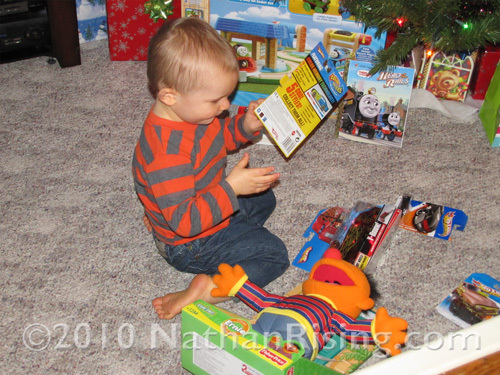 I’ve always heard of kids ripping through all of their presents before playing with them. But Nathan’s already proven to us that he’s not like other kids… he makes up his own rules! Ooh! I wonder if I can get in there through osmosis? Didn’t work. Maybe this book will teach me how to do it. Andrew sez ozmosis worx evry time. Can life get any better than Hot Wheels? Why yes, it can. 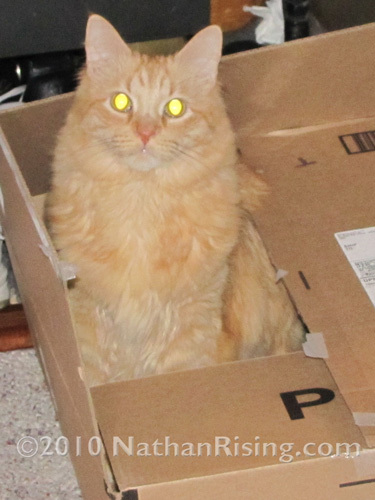 Just sit in a box and you will understand. I hope you all had a wonderful Christmas!! We most certainly did! 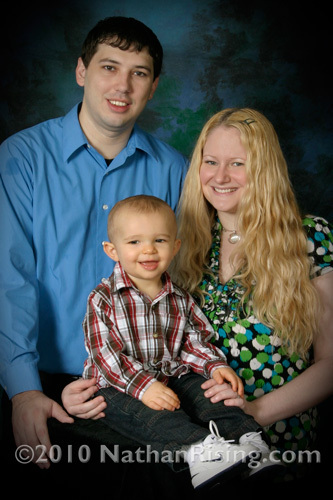 I am working on the pictures we took… and until I can get that post up, here’s a couple other pictures. 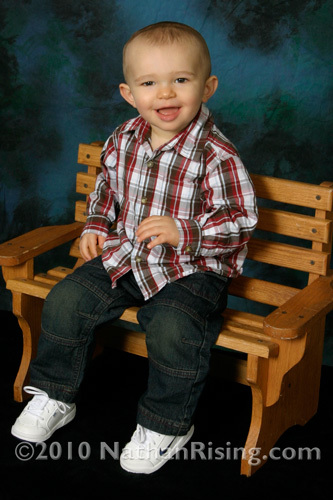 They were taken in September when Nathan was 19 months old. 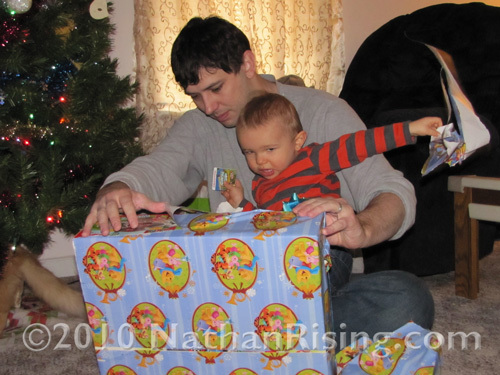 I’m so very excited to see how Nathan reacts to unwrapping his presents this year! 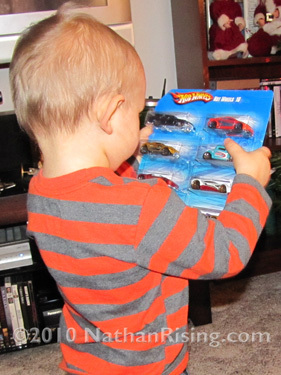 He had a lot of fun last year and thought all his presents were super cool, but he didn’t really understand the whole Christmas concept. Of course, he was only ten months old, by the way. 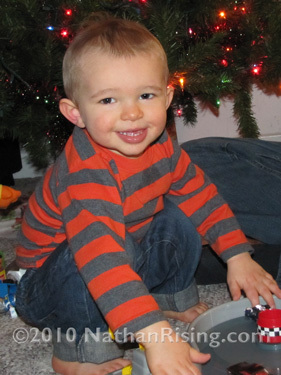 Speaking of the Christmas season, you guys want to know what drives me crazy? Well, I’m all about giving to charities. But every year around the holiday season, just about every place I go asks for donations. And how can you say no? YOU CAN’T. I mean, all the charities are for great causes… feeding hungry children, Alzheimer’s, cancer, etc. Anyone who refuses to donate to causes such as those (almost) deserves to be attacked by a random swarm of stinging insects and then pecked nearly to death by ravenous angry vultures. HOW CAN YOU SAY NO TO THE HUNGRY CHILDREN? The only issue I have with stores asking for my donation is that I am unfamiliar with most of the charities that I am being asked to contribute to. I don’t know how much of my money is actually going to feed hungry children or how much is actually going to go to Alzheimer’s research. I don’t feel comfortable donating to a charity that very well could only be giving a small percentage of that money for the cause. But then again, I CAN NEVER SAY NO. I don’t want to look up one day and realize that a tree squirrel is dive-bombing right at my head with arms laden with noggin-bruising nuts as the last thought I have before I hit the ground is I should have fed the hungry children. Because that’s karma for ya. So I give to the charities and hope that the stores chose one that is legit. I mean, it’s Christmas, afterall. And I totally get that people are in a more-or-less charitable mood, so it’s a lot easier to get donations from people this time of year more than any other. … to be busy! So I’ve almost gotten everything ready for Christmas! We have all the presents wrapped, errands completed, Christmas cards sent out (and I have my fingers crossed that they won’ t be too late! ), shopping done… all that’s left is there are for to to complete some gifts that I am making. Not quite done with those, yet.